KJIPUKTUK), HALIFAX - After weeks of talks the four health care unions and the government have agreed on a way forward. Unions will keep their members after all, and bargain collectively in four bargaining units province-wide. It was up to Health and Wellness Minister Leo Glavine to sum up what the demise of Bill 1 meant. .
“We have achieved something in Nova Scotia no other government has,” he proudly told reporters. 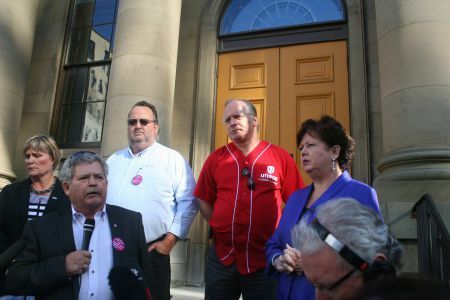 Health care in Nova Scotia went through at least six months of political upheaval, rallies at Province House, the Dorsey arbitration hearings, the efforts to fire Dorsey, only to end up with what the unions were ready to agree to all along. Not too many other provinces can boast of such an achievement. They may be called bargaining councils now, but in essence they are the bargaining associations proposed by the unions when Bill 1 became law back in September of last year. NSGEU, NSNU, CUPE and Unifor – will continue to represent their members, but bargain collective agreements jointly within four Councils of Unions: Health Care, Nursing, Administrative Professionals (Clerical) and Support Services. Each council will be led by one union. Bargaining committees will be proportionate to union membership in the respective bargaining units. Support Services negotiations will be led by a Chief Negotiator from Unifor, with a Deputy Chief Negotiator from the NSGEU. All affected unions will be bargaining at the table together. At a joint press conference last Friday leaders of all four health care unions mentioned the stress to union members caused by the political maneuvering. Joan Jessome, president of the Nova Scotia Government and General Employees (NSGEU) talked about the countless health care staff who chose early retirement or a job in another province over the uncertainty here in Nova Scotia. Both Lana Payne, president of Unifor, and Jessome singled out Jim Dorsey's arbitration efforts. His integrity and insistence that workers' rights be respected changed the landscape facing the liberal government, they said. The issue of unity among the health care unions was also addressed during the press conference. All four leaders went out of their way to suggest that division was less of an issue than it appeared to be as the situation unfolded over the last six months. Jessome mentioned that discussions were already planned among the four unions to deal internally with the allocation of thousands of CUPE members to the NSGEU as a result of the most recent Dorsey decision. And Janet Hazelton, president of the Nova Scotia Nurses Union, emphasized that she too always wanted a bargaining association. “We would have to deal with very upset members who didn't want to be in our union,” said Hazelton. For Hazelton the most important result of the new agreement is that it will see all Nova Scotia nurses, be they Licensed Practicing Nurses, Nurse Practitioners of Registered Nurses, at the same bargaining table. Danny Cavanagh, Nova Scotia president of the Canadian Union of Public Employees, summarized the consensus among the four unions. “We stuck steadfastly to the idea of bargaining associations, by whatever name you call it.